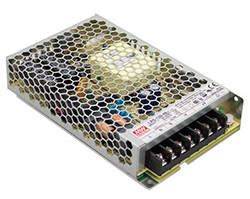 MEAN WELL’s LRS Series of power supplies are one of the highest quality products in the power supplies market. They deliver an extremely low no-load power consumption, easily meeting worldwide energy requirements and international safety regulations. Its streamlined circuitry lowers component count, raises the degree of automation and lowers the cost of production, passing down the savings to you. Not only does this series offer higher efficiency levels, it offers a price reduction ranging from 10-20% compared to the previous generation of MEAN WELL RS Series. Low cost and high efficiency: The LRS family is a continuation of the RS and S family. Same look and feel, but at a much lower cost, more compact 1U low profile, and higher efficiency ratings for power. Power efficiency determines how much power is lost through heat or MOSFET switching losses. Long life & high reliability: Due to higher mean time between failures (MTBF) and lower component count, the LRS lasts up to three times as long as its predecessors, the RS and S series. Various protection: Comes with protection against short circuit, overload, overvoltage and can operate in temperatures up to 70°C. They are cooled by free air convection, able to withstand 5G vibrations, and 300VAC surge input for 5 seconds maximum. 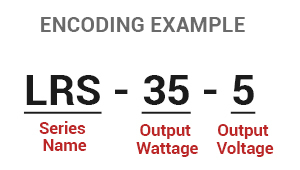 Types of Outputs: This series can output constant voltages of 3.3V, 4.2V, 5V, 12V, 15V, 24V, 36V, and 48V with power outputs of potentially 350W. Safety Regulations: Complies with international safety regulations such as IEC/EN60335-1(PD3) and IEC/EN61558-1. It not only satisfies every kind of industrial related application, but it can also be utilized in household appliances covering a broad range in diverse industries. The LRS is a single-output enclosed type power supply that sits at just 30mm tall. This low-profile design easily mounts into any application ranging from a simple project to a complex industrial application. LRS power supplies provide output power of 35W, 50W, 75W, 100W, 150W, 200W, and 350W feature overcurrent/overvoltage and short-circuit protection. Operating temperatures vary by size and operate at an altitude of up to 5000m. The metal casing aids in creating natural cooling to ensure heat dissipation. The LRS-350 series includes a built-in fan to reduce power losses which results from excess heat. Connections are made by screw-in terminals, making it easy to connect all of your ports. Mounting holes are available to securely mount the power supplies. LRS-35/50/75/100/150F: Adopt the full range 85-264VAC input. Jameco is your destination for Power Supplies. Our stock includes a variety of AC/DC and DC/DC switching power products. MEAN WELL carries thousands of standard power supply products to provide the power solutions for all types of applications. If for some reason you can't find what you need, just write us a note and we'll do our best to find it for you. Have more questions? Write us at [email protected].